So you’ve decided it’s time to commit to a travel coffee mug (welcome to the club!). From an ecological standpoint, this is an excellent starter step towards reducing your waste footprint, especially when you consider the presence of coffee in your day to day life. You might grab one on your way to work, around the 2 pm slump, etc. Or when you’re traveling, it’s so much easier just to grab one when you’ve gotten into the city center than to make one at your hostel. But having a reusable coffee mug is as handy for you as it is good for the planet—because whether you’re using it for your morning joe or something icy cool on a hot day, you’ll want to be able to take it with you and keep it fresh. We’ve pulled out the best coffee thermos that we could find to make your purchasing decision easier. Here are 10 of the best coffee travel mugs available on the market. Happy sipping! The first thing that your coffee thermos needs to be is durable; if you must replace it due to poor quality, it defeats the purpose of having a reusable travel mug. 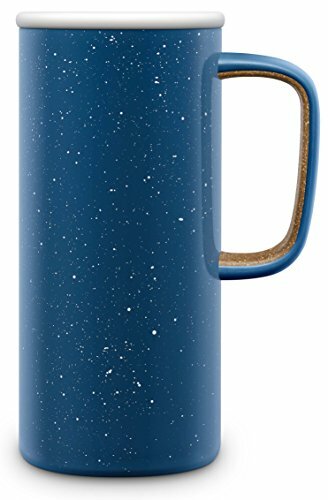 This list of best coffee travel mugs was compiled thoughtfully, ensuring that the materials used (things like stainless steel, double-walled glass, wood, or cork) are of the highest quality and committed to withstanding minor wear and tear. After all, we know you want to be able to rely on your coffee thermos for years to come. It should be your go-to grab when you’re jet-setting halfway around the world, because you never know when your coffee craving will hit, and it’s always nice to be prepared. If you’re opting for coffee, size matters—different cafés will make drinks in certain sizes only (usually 12oz or 16oz), so this can be an important factor for some when choosing a travel coffee thermos. Most of the options on our list of best travel coffee mugs hover between the 16 and 20oz mark. Smaller drinks can still fit, but you have a more flexible range of space for the days when your little 12oz cappuccino isn’t going to cut it, and you’re in more of a 20-oz-of-drip-coffee-with-cream-please kinda mood. The nice thing about most of these options is that while they can still fit a substantial amount of liquid in them to satisfy a bigger caffeine craving, they’re not overly bulky; most will fit comfortably into the netted cup holder on the side of many backpacks or tote bags. You don’t need too much from a coffee travel thermos; it’s pretty basic. The primary requirement is that it keeps your coffee piping hot or your cold drinks sufficiently chilled. But other than maintaining the sanctity of your drink temperature (is anyone else’s day ruined if their tea or coffee goes cold? ), features like handles, airtight seals, or grip can all affect how a travel coffee mug feels to you. Because if you don’t like it, you probably won’t use it, so we’ve ensured that your search for the best coffee thermos can end somewhere on this list. The first product on our list of best coffee travel mugs is from Ello and is a perfect option for anyone who likes camping. The design is nostalgic, mirroring vintage, outdoorsy styles with its simple deep blue coloring and white speckles (a peach color is also available). Most travel mugs lack one feature, which for some people is paramount to their portable coffee mug – a handle. This one does include a handle, and it’s lined with a cork inlay to give it added grip. Because of this, though, you won’t be able to slide it into most cup holders, whether it’s in a car, train, or the side of a backpack. This one is also an entirely leak-proof travel mug, thanks to an airtight lid. The mouthpiece – a small sliding mechanism – is pretty much the perfect size for a sip. Finally, the vacuum-sealed stainless steel lining keeps the temperature just right for the precious cargo contained inside. 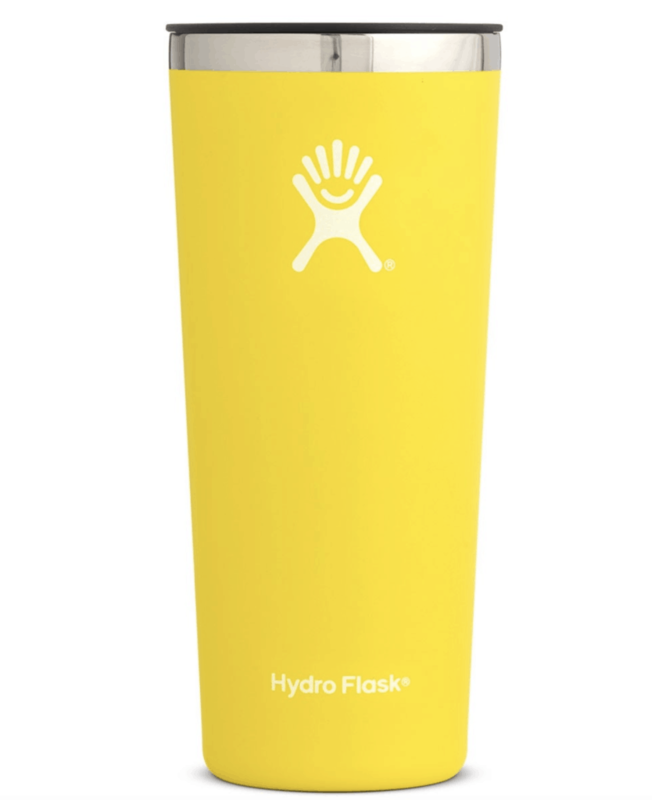 Twenty ounces, for those who need more than a little shot of espresso in the morning (you’re welcome) – so no matter what your day entails, you can quench your thirst at every turn with this Hydroflask travel mug. The twist cap makes it entirely leak-proof, so if you’re the kind of person who likes to add flavor packets to water, or sugar to your coffee, you can feel okay about giving this one a dang good shake to mix things up. Hey, flavor is important. The double-walled interior insulation will keep your morning coffee hot for up to 12 hours, or your icy water chilled for up to 24. If you happen to shop around a bit more with this brand, the cup is also compatible with other lids, so you can mix and match to best suit your needs for the day. Extra bonus: get color-happy. This baby comes in a whopping 12 different colors. The KeepCup has been sweeping through the “trendy office” scene for a minute now, and honestly, once we learned more about this portable coffee mug, it’s really not that hard to see why. First off, even though we’re quality first, we couldn’t deny that this option has got some serious chic. It’s glass, not steel, but you won’t burn your hand or get numb from cold just by handling it, thanks to the recycled cork panel that runs all the way around the cup. The lid twists on and has a plug to open and close it. This one is a massive hit with baristas since the cup fits under most espresso machines and it’s a good size for latte art (for Instagram of course – don’t worry, we all do it). The size of this cup is definitely a little smaller – only 12oz – so it’s geared more towards coffee. If you’re looking for a travel mug more inclusive of different beverages, you may want to go for something a little larger. This is one awesome coffee mug made by a sustainable brand. 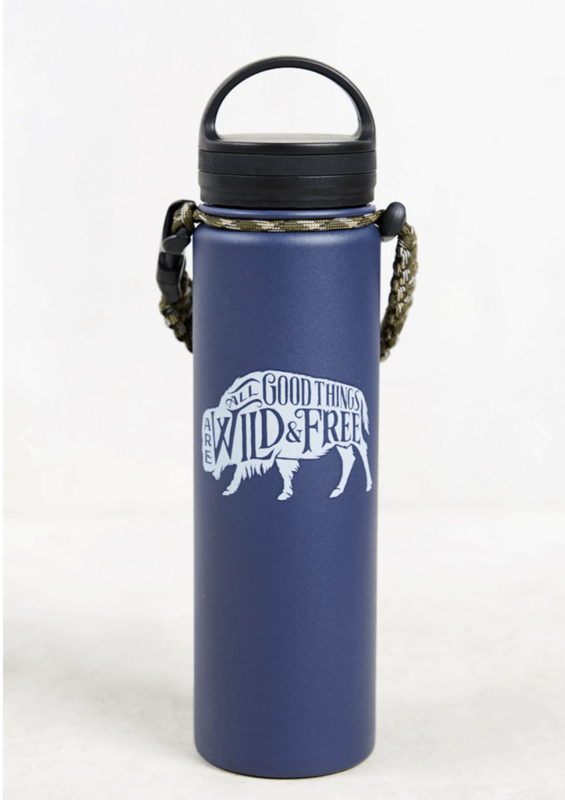 We have so many United by Blue products, but this stainless steel water bottle/mug is perfect for keeping my beverages handy while in the wild. Not only are all the designs amazing, but it comes with a braided paracord for easy attachments to our packs – perfect for hiking! This bottle keeps our stuff extra hot as it’s 100% stainless steel, has a vacuum sealed lid and is double insulated that keeps drinks hot or cold for 12 hours. What I love the most about United By Blue is how sustainable they are. For every product sold they remove one pound of trash from the ocean and waterways. To date, they have removed over 1,500,000 pounds of trash! They frequently host cleanups and are passionate about cleaning up ocean trash and plastic. Many of their products are made out of organic cotton, recycled polyester, and bison that the ranching industry discards. 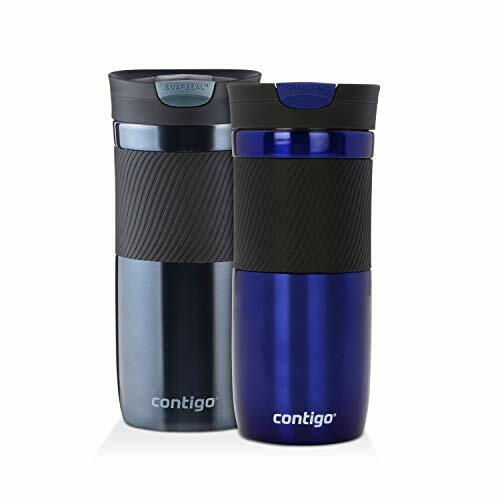 This Contigo travel mug is a no-nonsense, typical travel coffee mug – probably what most of us think of when we think of portable coffee mugs. Its outer design is simple and sleek, with a stainless steel face and a silicone outer grip for a non-slip experience. The snap closure is easily maneuverable with your thumb, so this is a good one-hander for people running to catch their train (for example). 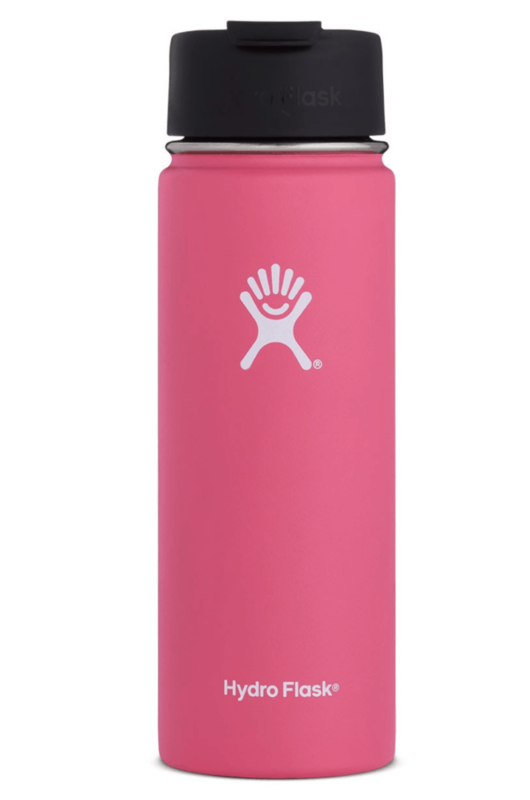 It’s fully leak-proof, and the insulated interior keeps drinks hot for up to five hours or cold for up to twelve. Since it’s on the slender side, it will fit comfortably into most cup holders, including totes & backpacks. It’s also dishwasher safe, so no careful hand washing required. 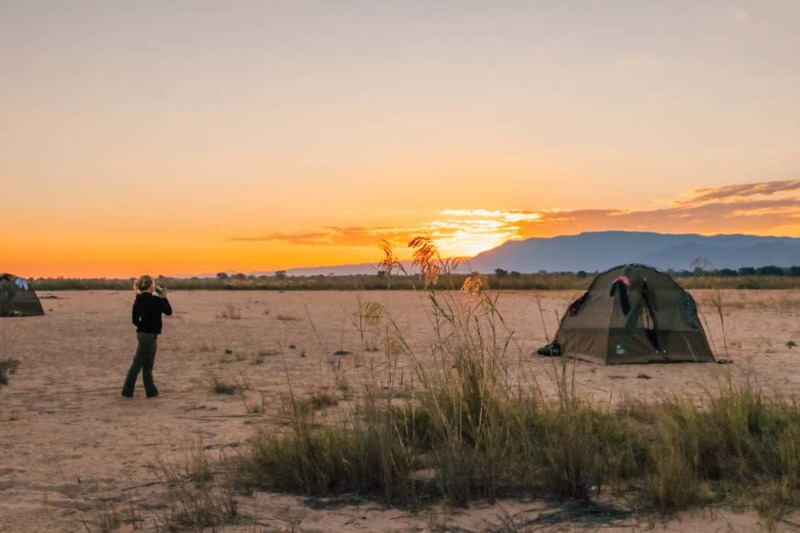 This is a good basic option for the traveler who wants something uncomplicated and inexpensive but without sacrificing quality and necessary features. 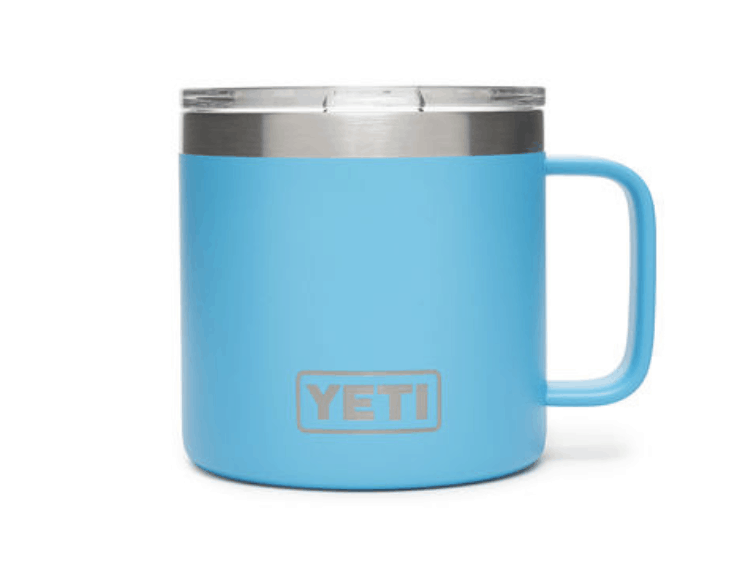 Another item we just got our hands on is the Yeti Rambler 14 oz mug. This is the travel mug to have if you want to sit and enjoy the views for awhile with a hot cup of coffee or tea. As it’s wide it doesn’t fit in many cup holders and serves more like a traditional coffee mug that is well insulated and comes with a lid. Yeti products are amazingly durable, tough, and have a double wall vacuum insulated body to protect your hands while still keeping your drinks piping hot. S’well makes some of the best reusable coffee cups possible. 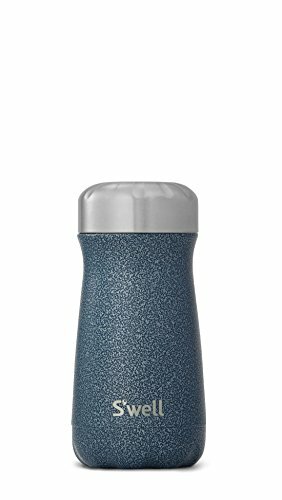 S’well may be having a moment, but its trendiness isn’t without reason; that’s why it earned a spot on our list of best coffee travel thermoses. Since this is more of a coffee thermos than their signature water bottle, it’s a little squatter and smaller (16 ounces), but it still has the features you’d need in a travel coffee mug. The time breakdown is: hot drinks stay that way up to 12 hours, and cold up to 24, so it’s on the high end of temperature preservation. While its triple-walled interior is doing the work keeping your drink palatable, the copper wall layer is preventing condensation, so you’re not constantly wiping your hands. Don’t let its slimmer neck fool you; if you prefer your coffee iced, ice cubes fit easily within. And with the faux-wood exterior, it also happens to look pretty dang cool. When we heard that Otterbox made travel coffee mugs, we have to admit our interest was very piqued. This company is the leading example in keeping your phone screen safe no matter what, so with quality like that, you can’t help but already trust any coffee mug they make. But we still had to check it out, and it definitely made the list of best coffee travel mugs. The exterior is sleek, basic, and very subtle. 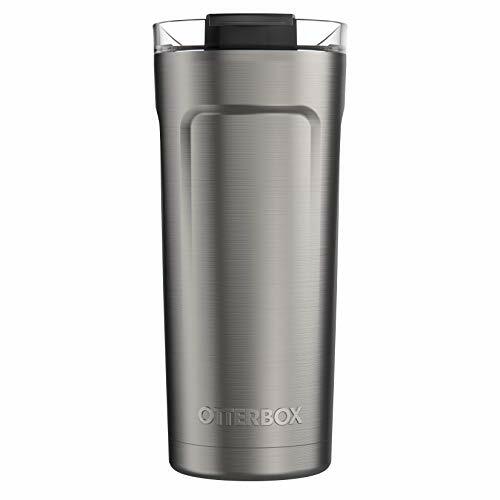 Food-grade stainless steel will withstand any abuse it takes (true to the Otterbox promise), and the internal copper sleeve is what will keep your drinks just right, temperature wise. Same as the S’well, it won’t bleed condensation all over the place. It also fits with a range of Otterbox lids (seriously, we’re not kidding; there are about six; from straw lids and French press lids to a shaker lid for that Friday night cocktail you’ve been craving). We couldn’t write this list without including the master brand of all portable thermoses, which is why number seven on the list goes to Thermos. This 16-ounce portable travel mug is probably what a lot of us think of when we think of travel mugs; vacuum sealed insulation for temperature retention, and two layers of stainless steel won’t sweat or be hot to the touch no matter how cold or hot your drink is. The sealing lid is entirely leakproof; it even has an interesting feature that many brands haven’t thought of – a tea bag hook built into the underside of the lid. Hey, not all of us are coffee lovers. Retain cold temperatures for up to 18 hours and hot ones for up to 7. A tapered base means that it stays put beautifully in cup holders. We were admittedly wooed by the dazzling rose gold exterior of this one (a color that, while trendy, will never not be stylish), but as it turns out, this portable coffee mug isn’t all about appearances. Smart features like a slightly squared lid for easier twisting, a non-slip ring for no accidents, and a lid that fully disassembles for a thorough cleaning make this a unique option, but one that ticks most of the boxes. It’s 16 ounces, so not the largest, but perfect for lattes or tea. Its slim build means you won’t have to hold it in your lap in the car or on the train, and honestly, with that color, it’s pretty eye-catching. This next option is as uncomplicated as its name. Totally insulated and vacuum sealed, this product boasts a whopping 40 hours of cold temperature retention and 12 hours for hot drinks. Though if you’re anything like us, we drink up the last drops of our morning joe in far, far less time than that. 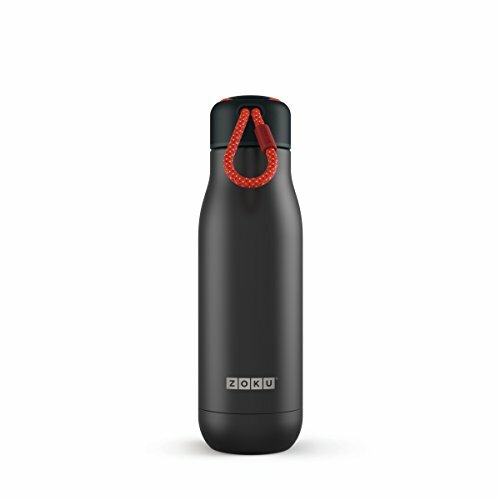 Like many portable coffee mugs, this option from Zoku is made from stainless steel, but is extra easy to lug around with you, thanks to a unique feature not seen in any of the other options mentioned here – a removable paracord lanyard built into the lid of the mug. So feel free to hold it as you walk (for easy sipping) or sling it around your wrist when you need to use your hands. 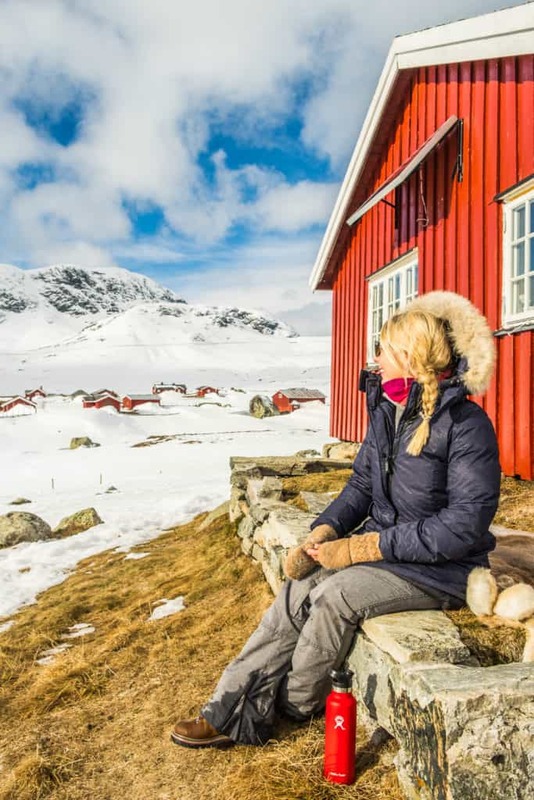 This is a great travel option for those going on slightly longer treks. It holds more than any option listed here (24 ounces) but is made of the same double walled stainless steel, though with a fun retro pattern of Scottish plaid. Despite its size, it’s still pretty lightweight at less than a pound and a half, so it’s a good companion for hikes. 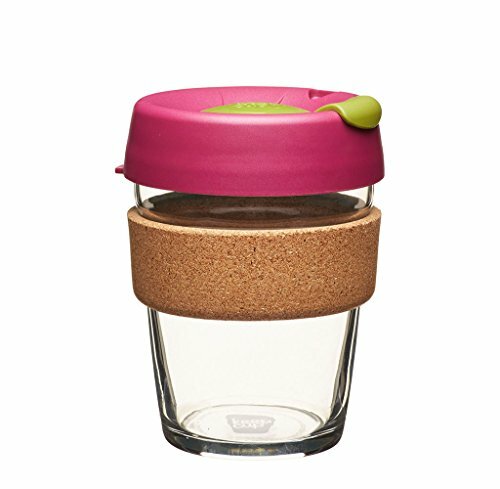 The lid is wide set and hollow, so while there’s no risk of hot items losing their steam, the lid is a perfect sip cup for anything from coffee to soup (though you may want to pack a spoon). This also makes a great sharing option if your travel buddy forgot to pack their own or just wants a little sip. You didn’t think I would forget about my other tea lovers out there did yu? 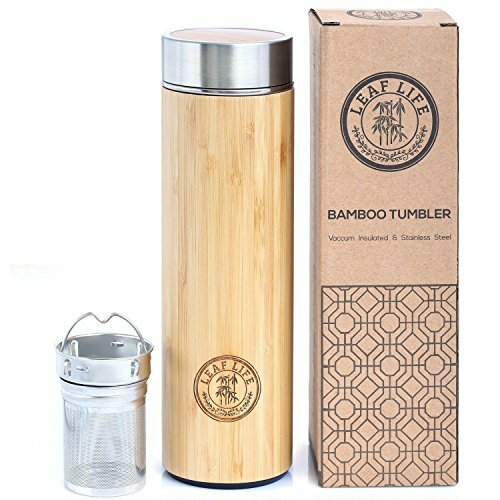 The LeafLife tea infuser is the best tea travel mug out there right now. It’s beautiful 100% bamboo exterior design means you can walk into any hip cafe around the world and blend right in. 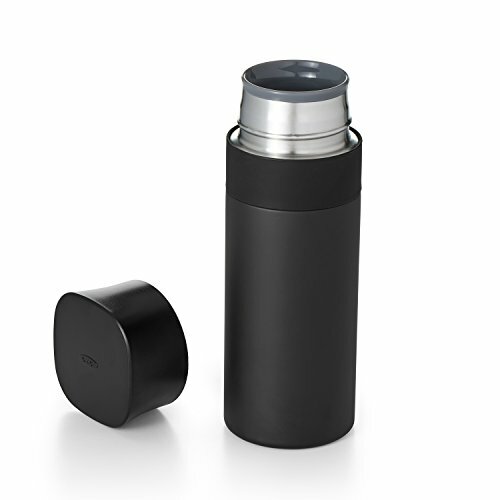 The inside of the travel flask is made out of food-grade stainless steel that is resistant to odor, stain, and bacteria. Each travel mug is BPA and Lead-free with no nasty chemical smells or harmful toxins. The insulation is guaranteed to keep your tea hot for the entire day. However the most unique part about this tea travel mus is the detachable tea infuser and strainer so you always pick up your favorite loose leaf tea around the globe and drink it instantly. 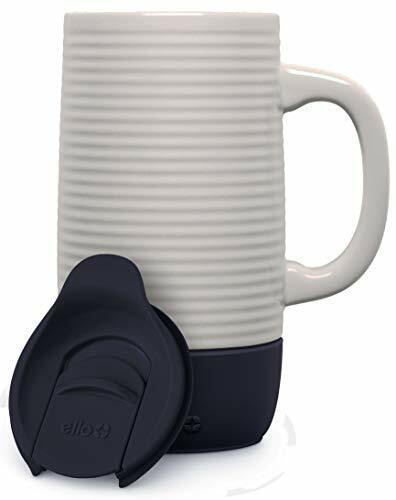 I generally don’t like traveling with ceramic travel mugs as they are more at risk of breaking and are heavy, but for those after a ceramic travel mug may want to consider the Ello Jane. The Ello Jane has a friction fit slider lid that secures easily and is certified BPA, phthalates and PVC free. The best part about this ceramic mug is that unlike the stainless steel mugs this one is dishwasher safe. In general, I don’t find the insulation as good with ceramic mugs as with stainless steel travel mugs, but they are still wonderful to drink coffee and tea from. PS! Why not join a coffee club? I’m guessing you really love coffee if you are reading this post? If that sounds like you, consider a subscription to Atlas Coffee Club. I just recently found out about Atlas Coffee Club and had a bag sent to me as soon as possible. 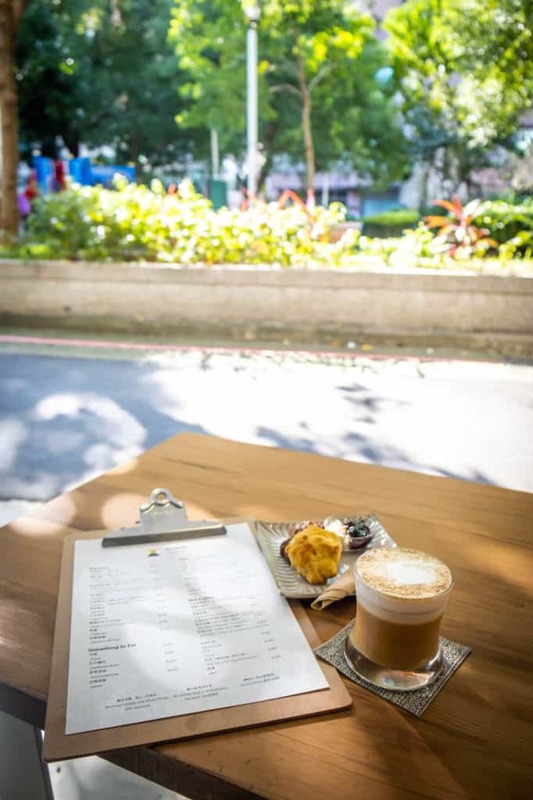 Atlas Coffee Club is an affordable subscription service for coffee. Every month a new bag of beans is sent out from somewhere around the world along with a postcard and of course a very fun and beautiful bag. Our last batch of coffee came from Papua New Guinea and is delicious. I’m anxiously awaiting next month to see where our beans are going to come from. Who says you actually have to leave your home to get coffee from around the world?